Fifteen times more links to Mail Online articles are shared worldwide via StumbleUpon than on Twitter, according to a study by Searchmetrics. During the six month period analysed, just over half (50.78 per cent) of links to Mail Online articles were shared on StumbleUpon, with Facebook activity (likes, shares and comments) accounting for 45.87 per cent and links on Twitter just 3.21 per cent. More than half (56.77 per cent) of the Guardian’s social links came from Facebook, with StumbleUpon accounting for 31.35 per cent and Twitter 10.98 per cent, according to the study. Some people we have shown this data to have been surprised at the volume of links generated for UK newspapers on the StumbleUpon social bookmarking site. This is a very popular site globally and the links could have been generated throughout the world from English speakers who use StumbleUpon. 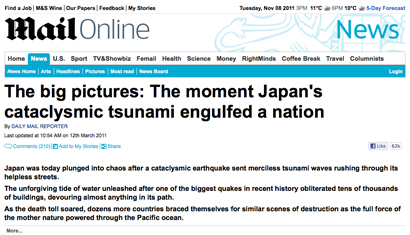 The most frequently shared content on the Mail Online was said to be an article (with images) about the earthquake in Japan which had been shared 392,521 times on the monitored social sites. The Guardian’s most frequently shared content was reportedly a humorous quiz discussing quotes from Muammar Gaddafi and Charlie Sheen. The Mail Online and the Guardian are the most visible UK newspaper websites on social networks such as Facebook, StumbleUpon and Twitter, according to a separate 10-week study by Searchmetrics, which analysed how often content from 12 leading newspaper sites was shared on six popular social networking and bookmarking sites. Mail Online came out on top, with links to its pages being shared 2,908,779 times a week on average. The Guardian came second with an average 2,587,258 links being shared on social sites every week. The Searchmetrics study monitored links shared on Facebook, Twitter, LinkedIn, StumbleUpon, Delicious and Google+ over a period of 10 weeks. Social news – that is news and articles that are shared or recommended by your friends and followers on social sites – is potentially an important source of traffic for online news sites. It’s worth noting that search engines, such as Google and Bing are starting to include popularity on social networks as a factor when judging the quality of web pages and how they should be ranked in search listings. So it’s important for news and other web sites to build and monitor visibility on social sites if they want to rank highly and attract visitors via search. The data for the study was taken from the global social media database which Searchmetrics operates to power its online software tools. This entry was posted in Social media and blogging, Traffic and tagged Facebook, Mail Online, searchmetrics, StumbleUpon, The Guardian, Twitter on November 8, 2011 by Sarah Marshall. StumbleUpon has released a new widget for news sites and blogs designed to help readers find content that is relevant to them. It will highlight content that millions users of StumbleUpon, a social aggregator, have recommended and can be used by news outlets to “surface content on the site with the best shelf life”, according to a post on ReadWriteWeb. The widget comes in three sizes and can be added by copying a simple line of code, as StumbleUpon explains on its blog. ReadWriteWeb’s post explains why web publishers should sit up, take notice, and consider creating a StumbleUpon widget. StumbleUpon claims to be the largest non-Facebook referrer of social media traffic. The company is not specific, but that would likely include Twitter, Reddit, Digg, XYDO and other similar tools for publishers. As of April 2010, StumbleUpon funneled twice as much traffic to publishers as Twitter. The user base is predominately between 18 and 34 years old and split 54 per cent male to 46 per cent female. StumbleUpon has a couple of other publisher products as well, including badges (which look like any normal share button) and a URL shortener (su.pr). The company claims that publishers get 20-25 per cent more traffic from StumbleUpon when they institute badges. There are a few drawbacks for publishers. A lot of publishers choose to self-aggregate content within posts or certain locations within their sites. The StumbleUpon widget would take that control from them and automate through the company’s index. Another drawback is widget/badge/button fatigue. Share buttons and third-party widgets have to be maintained by publishers and the more of them there are, the more of a time-consuming process it becomes. While the StumbleUpon widget takes up space where there would otherwise be nothing (or unsold ad inventory), it is another piece of real estate on the page. Increasingly, it is hard to justify clutter for the sake of utilising empty space. Facebook and Twitter both have widgets as well, and those ecosystems have millions more users than StumbleUpon does. Sometimes, simpler is just better. What do you think? Are you likely to install a StumbleUpon widget? Post your comment below. #tfn: Twitter for newsrooms launches – is it useful? This entry was posted in Editors' pick, Social media and blogging, Traffic and tagged buttons, ReadWriteWeb, StumbleUpon on June 29, 2011 by Sarah Marshall. Some quick analysis over at Malcolm Coles’ blog, suggests that Times Online is the most popular UK national newspaper when it comes to article-sharing/bookmarking on StumbleUpon. This entry was posted in Editors' pick, Newspapers, Social media and blogging, Traffic and tagged malcolm coles, StumbleUpon, Times Online, United Kingdom on February 20, 2009 by Laura Oliver. We give developers the opportunity to tell us journalists why we should sit up and pay attention to the sites and devices they are working on. This week’s starter for ten is the aptly named YackTrack, designed to find info related to a single issue across various sites. YackTrack is a service written by Rob Diana that allows a user to enter the URL of an article or blog post they want to find conversations about. The conversations can be occurring on blogs (WordPress only so far), Digg, Mixx, Technorati (in the form of “blog reactions”), Disqus, StumbleUpon (in the form of “reviews”) and FriendFeed. Based on the feedback I am receiving it seems to be useful to almost anyone. For a journalist, you can pick up a story from another site and run it through YackTrack, then get the all comments [made about the story] from other sites. blog posts talking about the same topic. If the topic if popular enough, you can grab several URLs from a service like TechMeme and run all of them through YackTrack and you could get a really good list of researchable articles. Yes there is more to come. Some things I cannot really talk about yet (as there has to be some suspense) and others are fairly straightforward. Registration and saving of URLs to track are a logical step forward. RSS and email notifications are also a popular request. More service support is necessary as well. I have also had requests for blog plugins, specifically WordPress. A few weeks ago, there were a number of blog posts on where comments were being posted and whether the fragmented conversation was a good thing. I think the fragmentation leads to more thought provoking conversations, but many bloggers do not know that their post was submitted to Mixx, Digg or StumbleUpon. Given that different sites have different cultures I thought it would be really interesting to have all of the conversations visible in one spot. I am getting the feeling that other people feel the same way. Right now it does not cost anything to use. The service is simple to use and I would like to keep it available in that way. I would like the service to pay for its own hosting, but I do not really want to charge the users. I do have Google AdSense on the site now, but that is more to see if there is any minimal revenue available. I am going to be looking at direct advertising as a revenue stream as well, as that could cover the hosting fees as well. This entry was posted in Journalism and tagged blogs, comments, direct advertising, Disqus, FriendFeed, google, Innovations in Journalism, journalist, Rob Diana, StumbleUpon on May 15, 2008 by Oliver Luft.